Stringed instruments produce sound when a plucked or bowed string vibrates at a given frequency. Different materials, such as steel, nylon and aluminum, are used to make instrument strings. 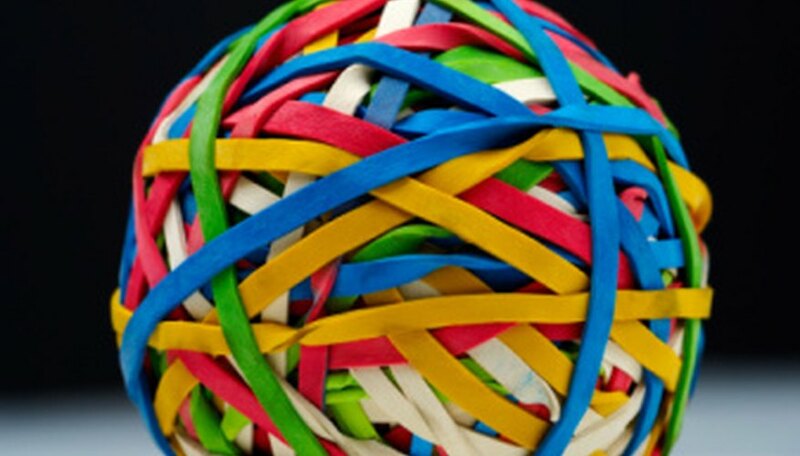 Although rubber bands are not durable enough to be used in performable instruments, they can be used as the strings in toy instruments for children. Many different types of rubber band instruments can be created from just cardboard, tape and taut rubber bands. Guitars are instruments with a rigid neck attached to a hard body. The strings are stretched along the length of the neck and extend over the body, where a variety of amplification methods increase the amount of sound produced. A rubber band guitar can be made by cutting out a piece of heavy-duty cardboard in the shape of a guitar. Stretch six rubber band strings along the length of it, extending from the top of the neck to the base of the guitar, and adjust their tightness to produce different tones. Ukeleles are similar to guitars, but they only have four strings as opposed to the guitar's six. Also, most ukeleles use a hollow body for sound amplification, while guitars are commonly found with both hollow bodies and solid bodies. Make a rubber band ukelele by fastening a short, thin, wooden plank to a tissue box and stretching the rubber bands along the plank over the opening of the tissue box. A simple toy instrument can be made from a plastic cup and a rubber band. Poke a small hole in the center of the bottom of the plastic cup, and thread the end of a rubber band through it. Fasten it with some glue. Play this instrument by stretching the rubber band and plucking it. The plastic cup amplifies the sound of the rubber band. Cover one end of a paper towel roll with wax paper and secure the edges on with a rubber band. Cut small, evenly spaced holes along the length of the paper towel roll. To use your rubber band horn, blow into the open end of the paper towel roll, and place your fingers on different holes to produce different tones. The wax paper vibrates at different frequencies depending on which holes are covered to produce different tones. Create different types of instruments by varying the shapes of frames cut out from cardboard, and stretch rubber bands across it in place of strings. Adjust the tautness of the rubber bands to adjust the pitch: Tighter rubber bands will have a higher pitch, and looser rubber bands will have a lower pitch. Two small dabs of strong glue on both ends of each rubber band is enough to hold the rubber band in place.